We like Mike, left, because he is cool and conservative. On top of that he plays bass. Larry Graham is surely proud. Since we have not heard Mike play we do not know if he thumps and plucks like Larry Graham (inventor of the thump and pluck). Bill Clinton might be Elvis but Mike Huckabee is Larry Graham. 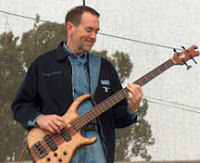 Mike Huckabee is the bass player for his band, Capital Offense. Huckabee recently won the Iowa Straw Poll and it gave his campaign renewed life. Huckwbee would clearly be a great president. Lucid and straight forward, he expresses his conservative values without hesitation and in clear tones. Huckabee is also good on global warming too. Black-Owned Country Clubs: Golf & Tennis Anyone? Prince Giving Away 'Planet Earth"